When you talk about Japanese food, most people think first of sushi, or perhaps a steaming bowl of ramen. But if you want to know what most Japanese people actually eat for lunch most days, then you have to consider the bento. Here we will explain everything you need to know about bento boxes. We will look at the long history of the Japanese bento box to see why they are so popular today for everyone from school children to prime ministers. We will find out how bento boxes are made, and where you can buy one. Most importantly we will reveal how you can make the perfect bento lunch yourself. If you’ve ever had a question about Japanese bento, you’ll find the answer here! 1. What is a Bento Box? 3. How Are Bento Boxes Made? 4. What Are Bento Boxes Used For? 5. What Are the Main Types of Japanese Bento? 6. Where to Buy Bento Boxes? 7. How to Make Your Own Bento Lunch? A bento is a single-portion boxed meal that is usually composed of staple carbs (rice or noodles), meat or fish, and an assortment of pickled or cooked vegetables. The world is derived from the Chinese Southern Song slang term Biandang, which means convenient. Since the 13th century, it has become a symbol of Japanese culture and ideals. The balanced nutrition and portability is ideal for school children and the workforce alike, and can often provide the perfect boost come afternoon. 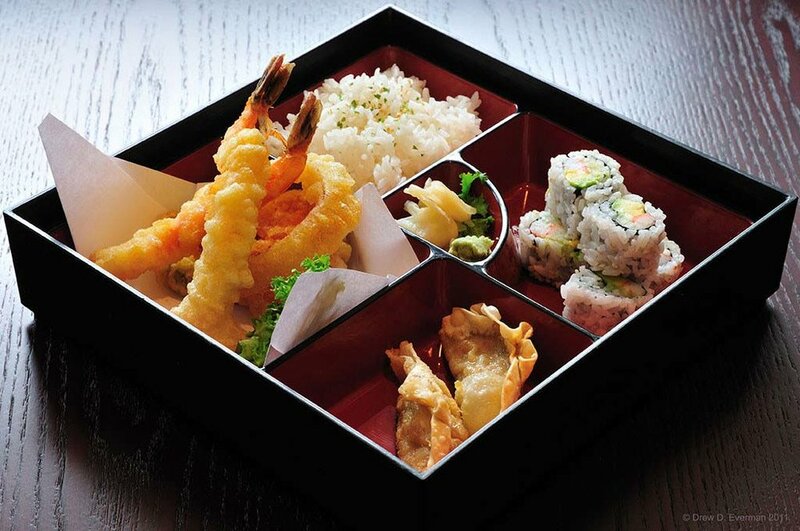 And of course that convenience comes curtesy of the perfectly designed and crafted bento box. The word bento was not used during the early days of the lunchbox’s conception. Starting in the Kamakura Period, around 1185, the term was actually hoshi-ii or dried meal. It would consist of only dried rice, without any packaging, that could be eaten as-is or boiled in water. It wasn’t until 1568, during the Azuchi-Momoyama period, that wooden lacquered boxes were produced to create the true bento that we know today. You can find out more about this versatile material in our Guide to Masterpieces of Japanese Lacquer. During the Edo period, from 1603-1867, the bento became an everyday meal, with contents and serving style varying depending on social class and occupation. Travelers and sightseers would carry koshibento (waist bento), which often included riceballs wrapped in bamboo leaves. For special events such as hanami (flower viewing parties), large, layered bentos were prepared to celebrate the occasion. In the twentieth century, aluminum began to be used in bento preparation, which paved the way for the microwavable konbini bento (convenience store bento), ekiben (train station bento) and hokaben (take-out bento). Before modern materials, bento boxes were hand-carved from wood. They were lacquered and designed by craftsmen; the more lavish the box, the more expensive the cost. The two fine examples from the collection of the Shinjuku Historical Museum show just how lavish they can be! The century-old tower-shaped bento on the left is inlayed with gold in fine lacquer. The gourd-shaped bento dates from the 19th century. The white half is a drinks container, which seems like it would be perfect for a party in the park! Nowadays, most of the world’s bento boxes are manufactured in the Ishikawa Prefecture of Japan. Molds are used to produce high-quantities of your favorite lunch containers, and original designs are fitted to each one. Presses are used to create and fix dividers and lids. Finally, the raw plastic is colored with a specialized paint gun. Screen-printing is used for more intricate patterns and illustrations. The stencils allow for flat or round boxes and sharp edges to be beautifully embossed. The boxes are then hand-packed and shipped all over the world, to make lunch more convenient for all. In Japan, parents often make bentos for their children during their early school years. It can be a laborious and daunting task, so prep work is often done the night before. Though presentation has always been a big part of the meal, once schools began requiring them, it became a competition to see who had the most creative and intricate bento. A child’s lunch often says something about their social standing and home life. Bentos are used to provide the most nutrition in the smallest and easily consumable way possible. The cute factor of the meal is not just for show, though. It is also a way to make picky eaters excited about the food that they normally wouldn’t eat. The more signature fast-food style bentos are less glamorous in appearance, but with costs often under ¥500, the wholesome meal just can’t be beaten, especially on a budget. Photographer Satoru Abe documents the richness and variety of bento lunches in his photoseries Nippon Cha Cha Cha. The photo above shows the tightly packed and regimented meal of a sailor in the Maritime Defense Force. There are several different types of bento to enjoy, all depending on the occasion. The makunouchi (between act) bento is one of the most common. It is characterized as being a two-section box that can be found in convenience stores, markets and department shops. One side will contain rice, while the other will hold an assortment of colorful side dishes. The koraku (Picnic) bento, is a large bento that is usually shared in a public setting, such as the park, and especially during cherry blossom viewing season, from late March to early April. It is mainly filled with traditional Japanese dishes that are chosen to reflect the season. 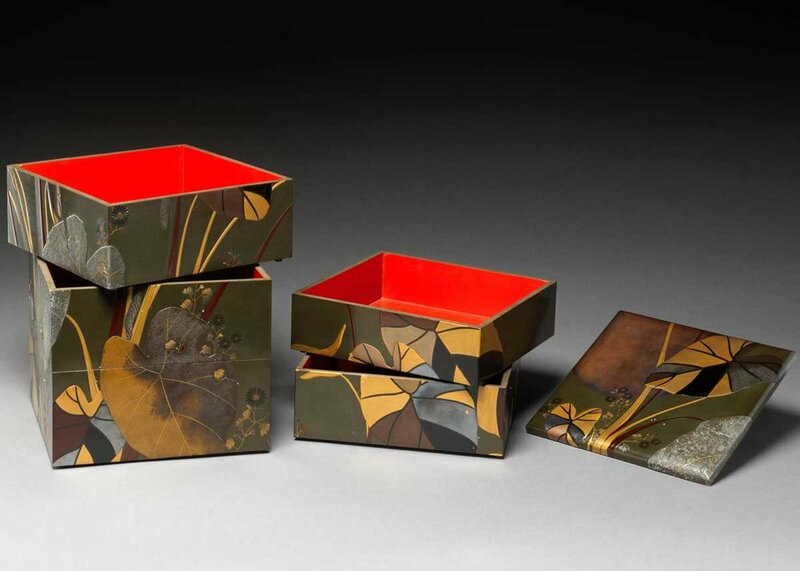 Similar to koraku bentos, jubako boxes are simply stacked atop one another to reveal an extravagant design. They have been used since the 18th century; often during New Year’s feasts and other celebrations. When arranged properly, scenes of nature and dressing rooms appear in glossy shades of gold. The tiered lunchbox is the perfect way to prepare enough food for everyone while not taking up too much space. The aisai (love) bento is one made by a significant other than often contains cute, specially crafted treats and sweet messages written in furikake (dry seasoning). It can be a lovely surprise to find a cute message or love-themed designs come lunchtime. There is also the slightly more creative kamameshi bento, with kama meaning ceramic or iron pot, and meshi meaning rice, which is a Gunma specialty bento. It is characterized by being warm and crispy, thanks to the earthenware pot used to hold its contents. Any variety of rice, meat or seafood, vegetables, fruits and nuts can be mixed together to make a satisfying and soul-warming meal. With all of this information at the tips of your fingers, it’s rather easy to take off on your quest for the perfect bento. If you’re in Japan to begin your new creative project, shops like Loft carry a multitude of trendy boxes and accessories, perfect for children and young adults alike, as well as some plain plastic models for the modest. Muji, a home goods store known for their aesthetically pleasing and simple designs, carries two variants in sleek black or white. One hundred yen shops such as Daiso also sell surprisingly sturdy and stylish bento boxes, though size-wise they run rather small. Even so, the simple patterns and pastel colors are suitable for year-round use, and can be customized with carrying clothes and chopstick cases for some added flair. If you’re not in Japan, worry not, you can get a great selection online. One retailer worth trying is Bento & Co, who offer a wide choice of both modern and traditional designs from their base in Kyoto, with very reasonable shipping. Now you can get a head-start on tomorrow’s lunch, as well as your long-term health. Whoever said that breakfast is the most important meal of the day obviously hasn’t eaten a delicious and nutritious bento. 7. How to Make Your Own Japanese Bento Lunch? The creation of a bento, whether it be mass produced or homemade, is relatively the same thanks to the healthy and wholesome ingredients used. With a sectionalized container as the base, there are four types of foods that should be involved; carbs, protein, vegetables and fruits; with carbs being the greatest proportion, and fruits and vegetables being the least. There is an unspoken rule of including at least one dish in the following colors: red or orange, yellow, green, white and black. During the cooking process, rice is prepared separately while the protein is stewed, broiled or fried. Vegetables and fruits are often made in bulk beforehand, and frozen for ease. A variety of textures and flavors make for a great bento, with each bite being its own unique experience. After arranging each item by type, and utilizing various silicone cups or dividers to avoid unnecessary movement, it is time to put a lid on your creation. Before closing the bento and wrapping it for safe travels, it should be left to cool completely, so as to reduce the risk of bacterial growth. Bento accessories and cute containers can be bought for relatively low prices and in hundreds of assortment options for personal preference. Though you can probably make a fine bento without any special tools, it definitely cuts down on time (and not to mention frustrating errors), to use specific knives, cut-outs and molds to create an aesthetically pleasing display. If it’s traditional aesthetics you’re after, you could try wrapping your finished bento in a Tenugui. Find out more in our Complete Guide to the Japanese Handkerchief! Of course if you don’t have time to make your own, ready-made bentos can be bought all over Japan in an assortment of price points and content. Fresh bentos can be bought from convenience stores such as Lawsons or 7/11. Each shop will carry several store-specific meals, but for the most part, you will find Japanese curry, soba and udon, classic fish and vegetable dishes, and even some more western variants such as the hamburger steak bento (a beef patty smothered in different sauces and served with rice and potatoes). Have you made a bento lunch yourself? What are your favorite ingredients? Let us know your experience in the comments below!